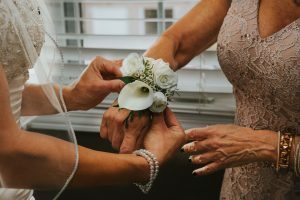 Many mothers of brides and grooms may feel what they wear to your wedding is the second-most important outfit they will ever wear (second to their own wedding of course). Unfortunately, shopping for that special dress isn’t as fun as it may seem — many mothers fear looking too matronly at their child’s wedding. Thankfully, there are now countless styles, sizes, and fabrics to make the process easier than ever before! Here at Blue Bridal Boutique in Denver, we’re dedicated to helping everyone in the bridal party feel beautiful on your big day. Visit us for wedding dresses and wedding dress alterations, and our in-house seamstress can even alter dresses for the mother of the bride or groom. Large department stores will have what you are looking for when it comes to mother of the bride (MOB) and mother of the groom (MOG) dresses. Whether the mother wants to splurge because her baby is getting married or she wants to be budget-conscious, mainstream department stores such as Nordstrom, Dillard’s, and Macy’s will always have your back. Many online stores will also now offer dresses for everyone in the bridal party — simply select the MOB/MOG category when shopping online! A nice gesture from the MOB or MOG, is to stay away from any white tones — you don’t want anyone detracting from your wedding dress! To make it easier on your mother and soon-to-be mother-in-law, be sure to offer guidance as to what colors may work best with your wedding or say what color you’d like them to wear. If there’s a certain color you don’t want them to wear (such as white, black, or red), be sure to let them know. The best advice to give them is to find a gown they love that flows graciously with the wedding colors. Whether it matches the color of the bridesmaids’ dresses, corresponds with a color in the floral arrangements, or twins with the groomsmen’s ties, try to stay within the overall color theme that has been decided upon for the wedding. This will make shopping easier because the options aren’t so endless, and it will also help with cohesiveness and flow in wedding photos. The MOB and MOG should feel elegant and beautiful for their child’s wedding ceremony. It is always recommended to try on gowns in person before making the final decision. Why? Because alterations may be necessary. Get your wedding dress alterations and MOB or MOG alterations done at the same place! 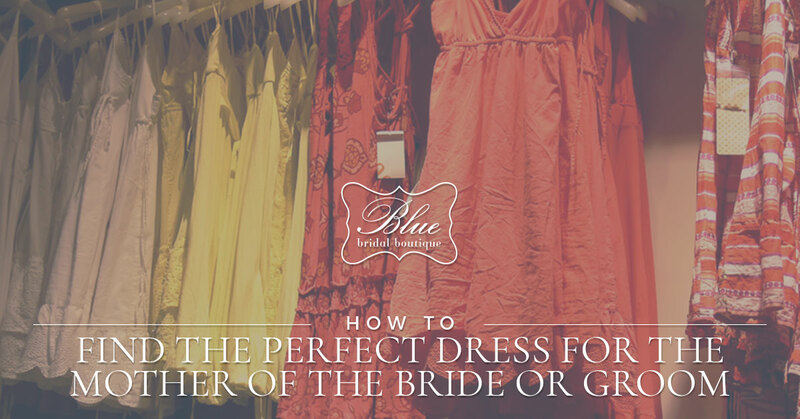 At Blue Bridal Boutique in Denver, we have an in-house seamstress who would be happy to help. You can do everything from lengthening or shortening the dress, adding sleeves, adjusting the neckline, and more. All of this will help the mother of the bride or mother of the groom feel special and beautiful on your big day. Contact our bridal shop today for bridal gowns, wedding dress alterations, or dress alterations for the mother of the bride or groom.